Helping others is not political. It is good for the soul. When you help others, you forget about your own problems for awhile. In addition, nobody should make you feel bad about who you decide to help. In my case, as a writer, I have interviewed many good folks assisting others – be they two legged or four legged – and ended up also giving to many charitable human and animal organizations. I had wanted to find a way to help the mothers and especially the children in detention centers. My first thought was to bring stuffed animals to comfort the children at one of the centers, but that didn’t work out. Then a successful business woman I know who came here from Central America over 30 years ago told me about going to the bus station to bring things to the mothers and children ICE was dropping off there. I decided that was a concrete way I could help. With the generous help of a good friend and my sister, we made up five bags of food, water and toiletries and took them to the bus station. At first we scoped out the situation and “stalked the bus station”. Our first attempt was unsuccessful because we got there too late. We found out from the cashier that the detention center van usually arrived earlier in the afternoon. I was also a bit shocked at the bus station. Before Greyhound moved, it used to be a bus depot with a building. Now it is a small outdoor affair with some benches and an overhang to protect from the sun, really a poor excuse of a bus station. We returned the next day right before 4 p.m. A security guard asked us for tickets. When I told him we didn’t have any and explained what we were doing, he was sympathetic and told us to wait behind the building until a white van pulled up. About five minutes later, a white van arrived. Two mothers and their children got out and after the detention guards left, the same security guard told the mothers to come see us. As a bilingual Latino himself, he truly has a heart. One mother was from Mexico and one from El Salvador. There may have been a third mother, too. There were several children and all of them were shocked and thrilled with the bags we gave them. My tender hearted sister cried. From what I have been able to gather, these are folks that have been released because they have family members in the US vouching for them, but they are still wearing ankle bracelets and have to check in. The next week we went back with more bags. This time I looked for the same security guard. The white van had already come and left and there were several families of single mothers and fathers with their children. They were from Mexico, El Salvador,and Honduras. They all thanked us profusely and even sent their children over to thank us. The children tore into the cookies. One man from Honduras stood out. He was traveling with his two sons and looked worried. He asked if he could borrow a phone to call his family in Virginia. He didn’t have a ticket or any money expect for Lempiras [Honduran money]. 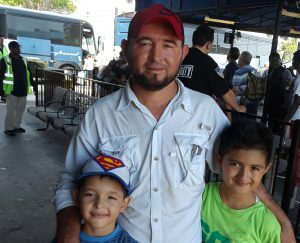 We lent him the phone and he reached his family, but he and his young sons had to spend the night at the bus station. We ran quickly to get them food. He insisted on giving us some lempiras in return! As we parted, he said, “Que Dios los bendiga,” may God bless you. May he and his sons find a better life here.